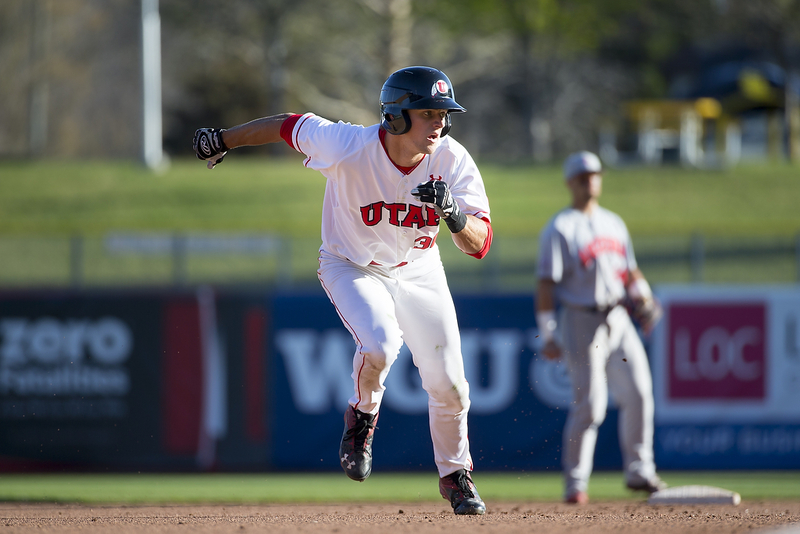 Utah s Chandler Anderson, a 2015 Park City High School graduate, races around the bases during a game against Arizona earlier this season. 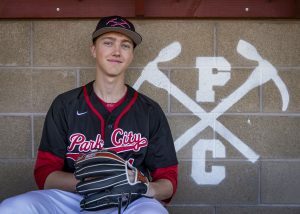 After coming close to a couple of 3A state titles with the Park City High School baseball team, it didn’t take Chandler Anderson long to find success with his new squad. As a freshman member of the University of Utah baseball team, Anderson and his teammates celebrated a Pac-12 title on Sunday afternoon at Smith’s Ballpark in Salt Lake City. After the final out was recorded in the Utes’ 21-7 victory over Washington (a score that would make the Utah football team proud), Anderson and his teammates poured over the dugout fence and rushed to the pitcher’s mound to join in a celebratory dogpile with the players on the field. Sunday’s game was never in doubt, unlike the game played on Saturday afternoon. Needing to take two of three games from the Washington Huskies to win an outright Pac-12 championship, the Utes fell 5-4 in Friday’s matchup. On Saturday, things weren’t looking good for the Utes through six innings as they trailed the visiting Huskies 7-5. Washington added another run in the top of the seventh to make it 8-5, digging the Utes into an even bigger hole. But that’s when Utah responded with perhaps its best inning of the 2016 campaign. The Utes sent 12 batters to the plate in the bottom of the seventh, plating seven runs to take a commanding 12-8 lead. From there, the bullpen shut down the Huskies and preserved the 12-8 victory to clinch a share of the Pac-12 championship. "That game was incredible," Anderson said. "It was jabs back and forth and then we came out on top with the big seventh inning. Fun fact: it’s the first Utah Pac-12 championship in any [men’s] sport." By earning the outright title on Sunday, the Utes secured a berth in this year’s NCAA tournament. It will be Utah’s first appearance on the big stage since winning the Mountain West Conference tournament title in 2009. In their first four seasons in the Pac-12, the Utes had never finished higher than last place in baseball. This year’s worst-to-first ride was special to the team’s seniors, but also to Anderson. "Everyone doubted us — we saw all the preseason rankings," he said. "That didn’t stop us. Every week, we’d talk about it in our group chat. 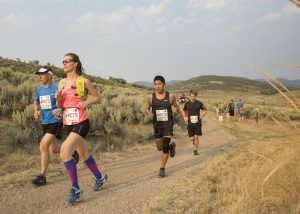 The negativity motivated us to be here where we are today." Though the Utes hadn’t shown any signs of being able to climb out of the Pac-12 cellar, Anderson said he sensed something special was going to happen when he arrived on campus and got to know his new teammates. "We all had confidence in our team," he said. "We were very good earlier in the season, then we had a little stumble, but something clicked and we came together." Anderson pointed to the first Pac-12 season series in Eugene, Oregon, as the moment something clicked for the Utes. "That first series win against Oregon — that’s when we knew we were the real deal," he said. "We were confident and that sparked us to get where we are today." Though Anderson, who hit .527 with three home runs, 11 triples and 13 doubles and swiped 24 bases for the Miners as a senior last year, saw his playing time decrease as the season wore on, he said he’s happy with his role and will do whatever he can to help the Utes’ season continue. He now serves primarily as a pinch-runner and defensive replacement late in games. "Right now, I’m doing whatever the coaches want me to do and I’ll keep doing that until I earn that [starting] spot," he said. "I’m confident in my play and that I’ll get that spot one day. I’ve started some games as a walk-on [this year] and I’m taking all [the playing time] I can get right now and I’ll make it work." 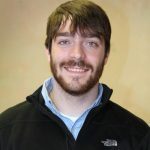 Anderson knows he could be starring for a junior college or getting regular playing time at a lower-level university, but he said that’s not what he wants in the long run. He chose to come to Utah as a walk-on in order to challenge himself both athletically and academically. "Earlier this season, I got some games and got some starts," he said. "I’ve always been one to put myself around higher competition and always push myself. This is exactly where I want to be." He added that he’s learned a lot about what it takes to be a Division I athlete in 2016. "With baseball, whatever you put in, it’ll give back to you," he said. "The hard work pays off. When you think you’re doing extra, you’re not. 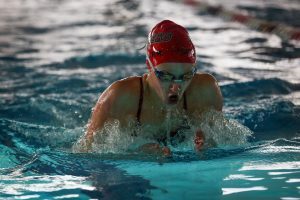 You have to keep working and keep competing." 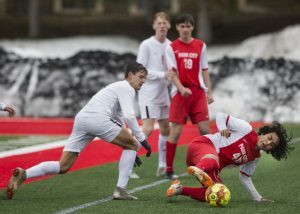 Since Anderson is only a short trip along Interstate 80 away from Park City, he said he’s been able to keep up with his former teammates at PCHS this season. "I love seeing them out there and going to their games," he said. "Those are still my guys." Though the Miners were dealt a tough exit from the first weekend of the 3A playoffs, Anderson sees good things coming in the future. He said he’s making sure to keep an eye on pitcher Ryan Brady, who, after his senior season in 2017, will head to Provo to play for Brigham Young University. Anderson said he’s excited for the first time the Utes and Cougars square off in the 2018 season and hopes he gets a chance to hit against his former teammate. "I can’t wait until that matchup," he said. "He’s got an electric fastball and a sharp curveball. I can’t wait until that day I get in the box against him." Utah will head to Oxford, Mississippi, to compete in the regional round of the NCAA Tournament. The Utes are the No. 4 seed in their four-team grouping. Host Ole Miss is the top seed, followed by No. 2 seed Tulane and No. 3 seed Boston College. The Utes take on Ole Miss at 6 p.m. MT on June 3 in the first game of the double-elimination tourney.